"Princess Marie of Hesse and by Rhine" redirects here. For the daughter of Ludwig IV and Princess Alice, see Princess Marie of Hesse and by Rhine (1874–1878). Maria Alexandrovna (Russian: Мария Александровна), born Princess Marie of Hesse and by Rhine (8 August 1824 – 3 June 1880) was Empress of Russia as the first wife of Emperor Alexander II. She was the mother of Emperor Alexander III. She was a daughter of Ludwig II, Grand Duke of Hesse, and Princess Wilhelmine of Baden. Marie was raised in austerity but was well educated by her mother, who took personal charge of her education but died when Marie was still very young. She was only fourteen years old when the Tsarevich Alexander Nikolaevich, later Tsar Alexander II of Russia, fell in love with her while he was traveling to Western Europe. She arrived in Russia in September 1840, converted to the Orthodox Church, took the title of Grand Duchess of Russia and traded the name Marie for Maria Alexandrovna. She married Alexander on 16 April 1841. The couple had eight children: two daughters and six sons. For fourteen years (1840–1855), she was Tsarevna, the wife of the heir of the Russian throne. She became the Russian Empress consort after the death of her father-in-law, Tsar Nicholas I.
Maria Alexandrovna learned the Russian language quickly; she was pious and identified with her adopted country. She did not enjoy court life of the duties of representation as she was shy and of a withdrawn nature. As a consequence she was not popular. She took a more focused interest in charitable activities after the death of her mother-in-law the Dowager Empress Alexandra Feodorovna in 1860. Maria Alexandrovna was particularly active in the field of female education, establishing Russia's first all female schools. She organized the Russian Red Cross and expanded its activities during the Russo-Turkish War of 1877–78. She was deeply affected by the death of her eldest son the Tsarevich Nicholas Alexandrovich in 1865. By then, her fragile constitution was undermined by her numerous pregnancies and by tuberculosis which afflicted her since 1863. To avoid the harsh Russian winters, she spent long sojourns in the Crimea and in southern Europe. During many summers she visited her family in Jugenheim, where she had spent her childhood. Her marriage to Tsar Alexander II started as a love match and it was happy for some years, but Alexander II had many affairs and in 1866 he fell in love with Catherine Dolgorukova and had four children with his mistress. Maria Alexandrovna was treated with respect by her philanderer husband and she was much loved by her surviving children. After a long illness, she died in 1880. The Mariinsky Theatre in Saint Petersburg, the city of Mariinsk in Kemerovo Oblast, and the city of Mariehamn in Åland are named after her. Empress Maria Alexandrovna was born as Princess Maximiliane Wilhelmine Auguste Sophie Marie of Hesse and by Rhine, on 8 August [O.S. 27 July] 1824 in Darmstadt. She was called Wilhelmine, like her mother, while in Darmstadt, but was known as Marie afterwards. Marie was the youngest child among the seven children of Ludwig II, Grand Duke of Hesse, and Princess Wilhelmine of Baden, a sister of the Russian Empress consort, Elizabeth Alexeievna. Maria Alexandrovna's parents were first cousins, but they were a mismatched couple. Ludwig, then hereditary Prince, was shy and withdrawn, while Wilhelmine, eleven years his junior, was pretty and charming. After the birth of three sons, the couple grew apart during the turbulent years of the Napoleonic Wars while Prince Ludwig was in the battle fields. However, after a gap of eleven years, Princess Wilhelmine went on to have four more children. Court rumors attributed the biological paternity of the second set of children to Baron August von Senarclens de Grancy, the Grand Master of the stables of the Grand Duke of Hesse. Of those four children, Marie and her brother Alexander, who was a year older, lived to adulthood. Ludwig officially recognized the children as his. By 1827, Prince Ludwig of Hesse and his wife became estranged. While Prince Ludwig occupied the Grand Ducal Palace in Darmstadt, in 1828, his wife moved with their two younger children and her household to Heiligenberg, a mountainside estate nestled on a hill overlooking the village of Jugenheim that she purchased that same year In 1829, however Wilhelmine and Ludwig celebrated their silver wedding anniversary in apparent harmony. In 1830, Marie's paternal grandfather, Ludwig I, Grand Duke of Hesse, died and her father, Ludwig II, became the new reigning Grand Duke. Gradually Marie's parents reconciled. Heiligenberg was used in the summer months by Ludwig II as well as his wife. Marie was four years old when she moved to Heiligenberg with her mother and her brother Alexander. It was there where she spent most of her childhood. Heiligenberg, originally built in simple German patterns, had been previously a nunnery and it was located some 20 kilometers from Darmstadt. Princess Marie grew up under the care of her mother who was responsible for her education. Wilhelmine had a preference for French culture and literature, which was evident in the way she educated her daughter, with a special emphasis on literature and history. When Marie was eleven years old, her mother died of tuberculosis. Marianne Grancy, a lady-in-waiting to Marie's mother, a sister of August von Senarclens de Grancy, took over the responsibility of Marie's education. After her mother's death Marie and her brother Alexander moved permanently to their father's court in Darmstadt. The two siblings would remain very close throughout their lives. 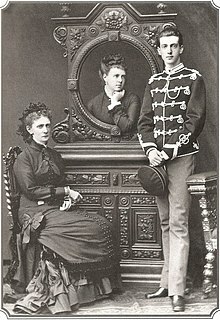 Marie also was close to her two elder brothers Ludwig III, Grand Duke of Hesse and Prince Karl of Hesse. The cloud over the legitimacy of their birth continued to be cast upon Alexander and Marie. On his part, their father, Ludwig II, was cold and distant towards his children. 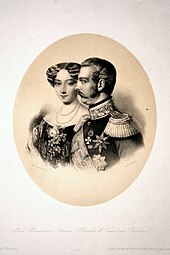 Alexander II and Maria Alexandrovna. Engraving. In the spring of 1839, the Tsarevich Alexander Nikolaevich, heir to the Russian throne, the son of Tsar Nicholas I of Russia, traveled to western Europe to complete his education and to search for a wife. His parents had preselected for him Princess Alexandrine of Baden, but, upon meeting her, Alexander's heart was unmoved. On 13 March 1839, after visiting the courts of Prussia, Württemberg and Baden, Alexander and his entourage made an unplanned stop at Darmstadt at the court of Ludwig II, Grand Duke of Hesse. Marie, the Grand Duke's only surviving daughter, was not on the list of possible brides. They stopped for one day in Darmstadt because it was on their way and they needed some rest. That evening, invited to the Opera house to a performance of La vestale to the music by Gaspare Spontini by the Grand Duke, Alexander was introduced to Princess Marie of Hesse. Although she was only fourteen, Marie was slender and tall for her age. She was girlish, still wearing her hair loose, fragile with a tiny waist, golden hair and bulging blue eyes. She was eating cherries and had to spit the seeds in her hands when she was pushed forward to be introduced to the Tsarevich. Alexander was smitten by her. Alexander's tutor, Vasily Zhukovsky, who was traveling with him, described the Princess as: "modest, charming and even intelligent." Alexander stayed to dine with the boring Ludwig II to see Marie again. Before he left Darmstadt, she gave him a locket containing a piece of her hair. That night Alexander wrote to his father: "I liked her terribly at first sight. If you permit it father, I will come back to Darmstadt after England." Nicholas I received the letter nine days later, as his son had carefully planned, on the day of the annunciation, and saw the timing as a good omen. Nicholas I gave his approval. He was not bothered by the gossip surrounding Marie's origin: if Ludwig II recognized her as his daughter, that was good enough. 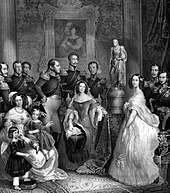 In London, Alexander was entertained by the young Queen Victoria and he later visited his aunt, Grand Duchess Maria Pavlovna of Russia in The Hague. In early June, he returned to Darmstadt to seal his engagement with Princess Marie. As she was not yet fifteen, a long engagement period was necessary before the actual marriage would take place. Towards the closing weeks of 1839, the Tsarevich returned to Darmstadt to visit Marie again. A Russian Orthodox priest came to Darmstadt to give Marie instruction in the Russian Orthodox religion. The engagement between Princess Marie of Hesse and the Russian Tsarevich was officially announced in April 1840. Two generations earlier, a princess of Hesse-Darmstadt had married a Russian Tsarevich. Princess Marie's paternal great aunt, Natalia Alexeievna, had been the first wife of Tsar Paul I, Alexander's grandfather. Natalia had died in childbirth after a labor lasting five days. In addition, Marie's maternal great-aunt Louise of Baden (Empress Elizabeth Alexeievna) had married Emperor Alexander I of Russia. She had died when Marie was only two years old. Alexander Nikolaevich's mother Empress Alexandra Feodorovna, born Princess Charlotte of Prussia, objected to her son's choice of a wife. She was not only disturbed by the rumors surrounding Marie's paternity but also ill-disposed towards the Hesse family and she was concerned that Marie might have inherited her mother's consumption. In a letter to his mother, Alexander wrote: "I love her, and I would rather give up the throne, than not marry her. I will marry only her, that's my decision!" Finally, after being persuaded by her husband Emperor Nicholas I, Empress Alexandra Feodorovna went to Frankfurt where she met Marie in June 1840. The Empress liked what she saw and gave her permission for the marriage. A few weeks after her sixteenth birthday, in August 1840, Princess Marie of Hesse and her party set out for Russia. She was escorted by her brother Alexander. Her governess, Mlle. von Grancy, went as well, and remained in Russia with Marie. Marie arrived in September 1840 and she shared her impressions of Saint Petersburg in a letter to her family: "St. Petersburg is much more beautiful than I thought. The Neva River contributes to this. I think it is difficult to find a greater city. The view from the Winter Palace on the Neva is wonderful!" Marie's arrival in Russia was greeted with great pomp and ceremony with a continuous round of festivities and amusements. French plays, operas and new ballets were performed in the Chinese theater, and each Sunday her future mother-in-law, Empress Alexandra Feodorovna, gave a banquet in the Alexander Palace. However, Marie had a hard time adapting to her new surroundings. Years later, her lady in waiting, Anna Tiutcheva, was to write about this period in the life of the young German Princess: "Having been raised in seclusion even, one might say, in austerity, in the little castle of Jugenheim (sic Heiligenberg), where she saw her father only rarely, she was more frightened than bedazzled when she was suddenly brought to the most opulent, most splendid, most brilliant court of all European nations. She told me that many times. After constant battles of overcoming her timidity and awkwardness, later on, under cover of darkness and the stillness of her own room, she would give freedom to her tears and muffled cries". Marie, who had been raised in the Lutheran religion, was received into the Russian Orthodox Church on 17 December [O.S. 5 December] 1840 and she became Grand Duchess Maria Alexandrovna. On the next day, the official betrothal was held in the presence of the Imperial Family, the whole court, the Russian nobility, many notable foreign guests, and representatives of foreign states. Alexander was twenty-two and Maria was only sixteen. Marie won the hearts of all those Russians who could get to know her. Sasha [Alexander II] became more attached to her every day, feeling that his choice fell on God given. Their mutual trust grew as they recognized each other. Papa [Nicholas I] always began his letters to her with the words: "Blessed be Thy Name, Mary." ... Dad joyfully watched the manifestation of the strength of this young character and admired Marie's self control. This, in his opinion, balanced the lack of energy in Sasha's lack of energy fro which he constantly worried about. The wedding took place on 28 April [O.S. 16 April] 1841 in the Cathedral Church of the Winter Palace in St. Petersburg, on the eve of Alexander's twenty-third birthday. Maria Alexandrovna wore a white dress richly embroidered with silver and diamonds. Over one shoulder lay a red ribbon and a crimson velvet robe with white satin and fine ermine was fastened on her shoulders. She was bedecked with a diamond tiara, diamond earrings, a diamond necklace, and diamond bracelets. Her future mother-in-law, Empress Alexandra Feodorovna, decorated the bride's hair with orange blossoms sticking them between the diamonds in Maria Alexandrovna's tiara, and pinned a small branch on her chest. The wedding was attended by members of the Russian Imperial family, the court and numerous guest and it was followed by a festive dinner ball. After the wedding the young couple settled in a suite of rooms in the south-west block of the Winter Palace. During the summer, they resided in Tsarskoye Selo. Their apartments there were located in the Zubov wing of the Catherine Palace. Maria Alexandrovna was naturally very shy and timid so she struggled to assimilate herself with the court and make friends. She disliked court receptions. Balls and city life bored her. However, etiquette obliged her to fulfill the duties of representation as the wife of the heir of the throne. She preferred country life in Tsarskoye Selo where she enjoyed a more private life. Maria and Alexander made a happy couple, full of love and tender care for one another. Alexander Nikolaevich ordered that banquets of fresh strawberries should be placed on his wife's dining table. He enjoyed his wife's company spending his mornings sitting on her bed, opening official documents and discussing states of affairs with her. There were regular informal gatherings at the young couple's household with out loud readings, music and card playing. The Tsarevich and the Tsarevna charmed their guests with their manners. Alexander trusted his wife's judgment and relied on her to support him in his work, while he guided her into society and gave her confidence. Sixteen months after her wedding, Maria Alexandrovna gave birth to her first child, Alexandra, born in August 1842, two years after Maria's arrival in Russia. In September 1843, she gave birth to a son and heir presumptive to the throne, Nicholas. Two more sons, Alexander and Vladimir, were born in 1845 and 1847. Shortly after having her third son, Maria Alexandrovna's health began to fail and she had to go to Bad Kissingen in Bavaria to recuperate. To mark each birth, Alexander and Maria planted oak trees in their private garden at Tsarskoye Selo, where skittles, swings and slides were provided for the children. In July 1849, both parents were devastated when their daughter, Alexandra, died from infant meningitis at the age of six and a half. Grief-stricken by her loss, Maria Alexandrovna had to go to the sea town of Revel in Estonia to recuperate. Even many years later, Maria Alexandrovna would still cry over the death of her eldest child. In January 1850, Maria Alexandrovna gave birth to a fourth son, Grand Duke Alexei. During her first decade in Russia, Maria Alexandrovna enjoyed the company and support of her brother, Alexander, who had accompanied her to Russia to follow a military career there. In 1851, Alexander of Hesse contracted a morganatic marriage with Julia von Hauke, one of his sister's ladies-in-waiting. As a consequence, he fell from grace and had to resign his Russian commission. He left the country, returning to Heiligenberg, the siblings' childhood home. In October 1853, Maria Alexandrovna had a much-awaited second daughter, Grand Duchess Maria Alexandrovna. In this early period of her life in Russia, Maria Alexandrovna was guided by her husband's aunt, Grand Duchess Elena Pavlovna. The two women, although seventeen years apart in age, became close friends and frequently ran their salons as a joint venture. Maria Alexandrovna loved reading. With her husband, she read Mikhail Lermontov's A Hero of Our Time, Nikolai Gogol's Dead Souls, Feodor Dostoevsky's Poor Folk, and later, Ivan Turgenev's A Sportsman's Sketches sharing Alexander's sympathies for the plight of the serfs and becoming an ardent abolitionist. Like her late mother, she took great interest in horticulture and gardening design. She imported lilies of the valley and cowslips from her native Germany. In the mornings, while her husband was away at work, she took long walks with her ladies-in-waiting through the parks at the Catherine and Alexander Palace at Tsarskoe Selo. Indoors, she played the piano with her children, created tapestries and took on interior decorating. Serious in character and intelligent, Maria Alexandrovna enjoyed her husband's confidence and supported his ideals of introducing political reforms. Two opposite philosophical currents divided Russian politics of her time: Westernizers and Slavophiles. The Westernizers, led by Alexander Herzen, Vissarion Belinsky, Ivan Turgenev and Mikhail Bakunin, wanted Russia aligned to Western science and values such as free thought, rationalism and individual liberty. By contrast, the Slavophiles, led by Aleksey Khomyakov, the two Aksakov brothers, Konstantine and Ivan, and Ivan Kireyevsky and his brother Pyotr Kireevsky advocated three principles: Autocracy, Orthodoxy and Nationalism. Maria Alexandrovna embraced Slavism with fervor. "The first time I set eyes on the Grand Duchess," wrote her maid of honour, Anna Tiutcheva, "she was already twenty-eight years old, but still looked very young. She retained that youthful appearance all her life; when she was forty, she could have been taken for a woman of thirty. Although she was tall and slender, she was in fact so thin and fragile, that at first glance she gave no impression of a 'belle dame'; however, she was unusually elegant, with that special kind of grace, which can only be found in old German paintings, or Madonnas by Albert Dürer. Her facial features were regular. Her beauty lay in the wonderful, delicate color of her skin, and her large, slightly bulging, blue eyes, which looked at you with timidity and perception...she seemed almost out of place and uneasy in her role as mother, wife, and empress. She was tenderly attached to her husband and children, and conscientiously fulfilled the duties which her family and exalted rank demanded of her. The Empress's mind was like her soul: subtle, refined, penetrating, extremely ironic, but lacking in ardor, breadth and initiative." On 18 February 1855, Nicholas I died of pneumonia, and Maria's husband ascended to the Russian throne as Tsar Alexander II of Russia. It was a turbulent period as Russian troops were being defeated by an international coalition in the Crimean War. After a siege lasting eleven months, Sevastopol fell in September 1855. With a bleak prospect of invasion from the west if the war continued, Russia sued for peace in March 1856 in Paris. The humiliation of the Crimean defeat was left behind by the coronation festivities that were held with Byzantine splendor from 14 to 26 August 1856. The coronation ceremony lasting five hours took place at the Assumption Cathedral of Moscow Kremlin on 7 September [O.S. 26 August] 1856. When four court ladies tried to fix the crown to the Empress's head it nearly clattered to the ground, saved only by the fold of her cloak. Maria Alexandrovna was only thirty years old when she became Empress consort. 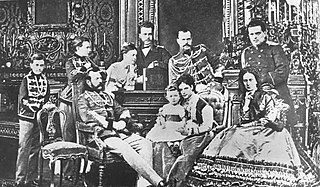 Nine months after the coronation, Maria Alexandrovna gave birth to a fifth son in April 1857. Her health was already declining. Suffering from depression, she was sent to Kissingen to recuperate. On 3 October [O.S. 21 September] 1860 Maria Alexandrovna gave birth to Grand Duke Paul Alexandrovich, her eighth and last child. She was so weakened that she was forced to spend several months resting on a couch in her boudoir in the Winter Palace. A month after Paul's birth, Maria's mother-in law died. Since Russian tradition gave precedence to a dowager empress over the reigning tsar's consort, it was only then that Maria Alexandrovna took a more decisive role in charitable activities. It was with her that the Red Cross was established in Russia, which quickly turned into the largest public and state structure, accumulating in its accounts huge sums transferred by benefactors from all over the Empire. The Tsarina was the supreme patroness of the Red Cross. In total, the Empress patronized five hospitals, twelve alms-houses, thirty shelters, two institutes, thirty-eight gymnasiums, 156 lower schools and five private charitable societies. Maria Alexandrovna was particularly active in the field of female education. The beginning of a new era in women's education in Russia was marked by the establishment of open all-union women's educational institutions (gymnasiums). The Empress also played an important role in the liberation of the peasants that came into fruition with the Emancipation Manifesto on 3 March [O.S. 19 February] 1861 ending serfdom in Russia. The Empress paid great attention to the upbringing and education of her children, carefully choosing experienced teachers for them. She brought them up strictly. Her efforts centered on her eldest son, Tsarevich Nicholas Alexandrovich, her favorite child who resembled her most. The Russian court was known for its magnificence. The season began in early December and lasted until Lent. Endless balls and banquets were held indoors in overheated palaces, while subzero temperatures and icy winds kept the streets empty. Daylight shined for only four hours. The Tsar gave intimate parties known as Les Bals des Palmières for which hundreds of palm trees specially grown at Tsarkoie Selo were brought to the Winter Palace in huge, horse-drawn boxes. Around each palm, a table for fifteen people was arranged. Tsar Alexander II was a gracious host, making the rounds of the tables as soon as his guests were seated. The Empress did not share his enthusiasm. She disliked court events and considered Russian nobility frivolous. Society complained that she seemed cold and distant, lacked charm, had no conversation and no taste in dress. She was criticized for her religious fervor and fondness for music and poetry. As a result, she was not popular. Behind her back she was called la petite bourgeoise allemande. Empress Maria Alexandrovna of Russia. As Empress consort, Maria Alexandrovna had to attend many state functions, but from the 1860s her health declined. The doctors advised her to spend the winters in a warm climate in an effort to prolong her life. Preferring to remain in Russia, she agreed to the suggestion of recuperating in Crimea. Alexander II then bought for his wife Livadia, a two-story wooden villa from the heirs of Count Lev Potocki, a Polish aristocrat. At the end of August 1861, Maria visited Crimea for the first time. She arrived with her husband and their children Alexei, Sergei and Paul. She was charmed by the southern flora, the mild climate, the beautiful house and the surrounding park. The original modest villa was expanded with the additions of a large palace, a small palace, and a church. Construction took place between 1862 and 1866 under the direction of Ippolito Monighetti, a Russian architect who had redecorated Maria Alexandrovna's apartments in the Catherine Palace during the 1850s. The humid summers in Saint Petersburg also took a toll on Maria's frail constitution; as a consequence, she was absent from Russia's capital for long periods of time. In June 1864, she left Russia, accompanied by her husband and their three youngest children, to take the waters in the Bavarian spa of Bad Kissingen. King Ludwig II of Bavaria came to meet her and became infatuated with her. 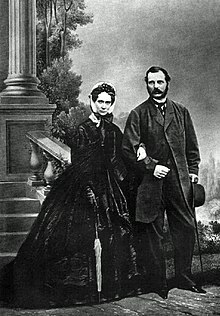 In late July, Alexander II returned to Russia, but Maria Alexandrovna traveled to Bad Schwalbach where she celebrated her birthday with Ludwig II. They were distant relatives and he called her "aunt". Empress Maria Alexandrovna of Russia with her husband and children. Seated in the first row, left to right are: Emperor Alexander II, Tsarevna Maria Feodorovna. with her son Grand Duke Nicholas Alexandrovich on her lap, and Empress Maria Alexandrovna. In the second row, same order: Grand Duke Paul Alexandrovich, Grand Duke Sergei Alexandrovich, Grand Duchess Maria Alexandrovna, Grand Duke Alexei Alexandrovich, Tsarevich Alexander Alexandrovich, and Grand Duke Vladimir Alexandrovich. c 1870. In late August the whole family was reunited in Darmstadt. As the Empress was still sick, she decided to spend the winter in Nice where she received the announcement of the Tsarevich's engagement to Princess Dagmar of Denmark. Her eldest son was nevertheless in frail health. He joined her in Nice in early 1865, but by then, he was seriously ill with meningitis of the spine. Attended only by her brother Alexander and her sister-in-law, the Empress did not leave her son's side during his illness. The Tsarevitch initially misdiagnosed with simple rheumatism, deteriorated rapidly. The family gathered around his sick bed and he died on 24 April [O.S. 12 April] 1865. Maria Alexandrovna was devastated by the death of her eldest son on whom her hopes for the future lay. Broken by his death, the Tsarina spent the following year grieving. She found some solace with her family in Hesse and with her brother Karl whose only daughter, Anna, had died a week before Nicholas. Maria Alexandrovna had focused on her eldest son so much that she neglected her middle ones: Alexander, Vladimir, and Alexei. Princess Dagmar, the Tsarevich's fiancée, who was with the Romanovs during Nicholas's final days, was quickly engaged to Maria's next oldest son, the future Emperor Alexander III, whom she would marry the following year. In 1866, Alexander II and Maria Alexandrovna celebrated their silver wedding anniversary. With the passing of the years, they grew apart, particularly after the birth of their last son and the deterioration of her health. While the Empress remained in love with her husband, Alexander II had many affairs, but they did not threaten their marriage. From the mid-1850s until 1862, he had a relationship with Alexandra Sergeevna Dolgoruki (30 November 1834 – 12 September 1913). Alexandra belonged to one of Russia's most illustrious families and became one of the Tsarina's ladies in waiting in 1853. This affair ended in 1862 when Alexandra married general Pyotr Pavlovich Albedinsky (1826-1883). In 1865, Alexander II fell deeply in love with 18-year-old Princess Catherine Dolgoruki, a distant cousin of his former mistress. Catherine resisted him for over a year, but in July 1866, they became lovers. Inevitably Maria Alexandrovna heard about the affair, but initially, she did not attach great importance to it. Empress Maria Alexandrovna with her children Grand Duchess Maria Alexandrovna and Grand Duke Paul Alexandrovich of Russia. In order to have comfortable accommodations and rest in their route from St Petersburg to Crimea, Alexander II ordered the reconstruction of the Imperial Palace in Kiev. It was in total disrepair and abandoned for almost half a century after the palace burned down in a series of fires in the early 19th century. The commission was assigned in 1867 to the architect Konstantin Mayevsky, using old drawings and watercolors as guide. Work took place from 1868 to 1870 and the Kievan palace was then renamed Mariyinsky Palace after the Empress Maria Alexandrovna. By her wish, a large park was established off the southern side of the palace. The palace was used as a residence for visiting members of the imperial family until 1917. The Mariinsky Theatre in St Peterburg is also named in honor of Empress Maria Alexandrovna. It was built in 1859-1860 according to the plans of architect Albert Cavos as an opera and ballet house. The theatre opened on 2 October 1860, with a performance of Mikhail Glinka's opera A Life for the Tsar. The new theatre was named Mariinsky after its imperial patroness, Empress Maria Alexandrovna. Form the early 1860s through the 1870s, Maria Alexandrovna began to pay extended visits to her homeland. Usually accompanied by her husband, children and a Russian entourage, she stayed at Schloss Heiligenberg, the small castle of her brother Alexander, who lived with his morganatic wife and their children at Jugenheim, outside Darmstadt. There she met Princess Alice, second daughter of Queen Victoria and wife of her nephew, Prince Louis of Hesse. She resisted Alice's suggestion that her brother Prince Alfred, Duke of Edinburgh, marry Marie's only daughter Maria, but the couple would wed anyway in 1874. In December 1875, Empress Maria Alexandrovna visited England to meet her first British grandchild. Queen Victoria wrote: "I thought her very lady like.. and very kind and amiable. We were at ease at once, but she has a sad expression and looks so delicate. I thing we should get on very well together, poor thing I pity her much. After Alice died in 1878, Marie invited the motherless children to visit during the holidays she spent with Alexander's family at Heiligenberg. It was during these visits that her second youngest son, Grand Duke Sergei, met his future wife, Alice's second daughter, Princess Elisabeth of Hesse and by Rhine. It was also here that Maria met Elisabeth's youngest surviving sister, Princess Alix, who would eventually become the devoted, though ill-fated, wife of Maria Alexandrovna's eldest grandson, Emperor Nicholas II. A legend alleges that on a visit to Darmstadt, upon meeting Alix, Marie turned to her maid of honour with the words, "Kiss her hand. That is your empress to be." In later years Nicholas II's eldest daughter, Grand Duchess Olga, claimed that as a small child she saw the ghost of her great-grandmother, Maria Alexandrovna, according to her nanny, Margaretta Eagar. Maria Alexandrovna knew Alexander was unfaithful and had many lovers. 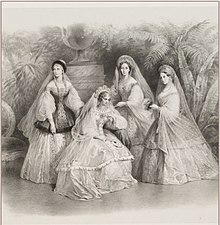 The Tsar had three children with his mistress, Princess Catherine Dolgoruki, whom he moved into the Imperial Palace, along with their children, during Maria's final illness. After the Empress's death, the two entered into a morganatic marriage on 18 July [O.S. 6 July] 1880. ^ "General Information" (in Russian). Retrieved January 22, 2018. ^ a b c d e Huberty, Michel; Giraud, Alain; Magdelaine, F. and B. (1994). L'Allemagne Dynastique, Tome VII -- Oldenbourg. France: Laballery. pp. 73, 232, 244, 258–260, 274. ISBN 2-901138-07-1. Markelov I.I. Memories of 1839. The first meeting of Emperor Alexander II and the Empress Maria Alexandrovna. Russian Antiquity., 94, №4 .. - 1898. - 19-22 p.
Tiutcheva, Anna Feodorovna. At the court of two Emperors. Moscow, Novosti. 1990. Zeepvat, Charlotte. Heiligenberg: Our Ardently Loved Hill. Published in Royalty Digest. No 49. July 1995. Wikimedia Commons has media related to Empress Maria Alexandrovna of Russia. This page was last edited on 7 March 2019, at 08:51 (UTC).